Last year, Hartzell gave our fans incredible access to the 2014 Red Bull Air Race World Championship. With the first race of the 2015 season on the horizon, we are proud to announce the renewal of our technical partnership with the Red Bull Air Race. This means every racer will once again be flying with our advance aerobatic propeller, known as “The Claw.” The renewed partnership also means Hartzell will once again be giving you an up-close look at the world’s fastest motorsport. The Claw got its name from world-famous aerobatic pro Sean D. Tucker, who noted the three-bladed composite prop’s high trust and low inertia and gyroscopic forces. It was designed to reach the absolute limits of aircraft performance. That makes The Claw the perfect pairing for a sport where winners are often separated by a tenth of a second. If last year is any indication, the races will continue to be faster and safer thanks to hi-tech composite propeller technology. 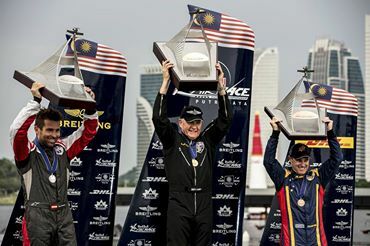 The Red Bull Air Race World Championship is a one-of-a-kind spectacle of high performance technology and human skill. The entire Hartzell team is honored to support the racers as they showcase the pinnacle of precision aviation. Visit RedBullAirRace.com to learn more about the racers, the locations and the upcoming season.